The following information, compiled by my uncle, W.O. "Bill" Anderson, in the late 1970s, is on file at the Nelson County (Virginia) Historical Society. Until recently, I was not aware that my uncle had done this much research--he died before I became interested in our genealogy. As I do not know his sources, I cannot verify accuracy, but I know that he was thorough with all things in his life; I'm assuming that he had this information well documented before submitting it to the Historical Society. I am transcribing his report as he wrote it. Any question marks indicate areas where I'm uncertain of the words, due to his handwriting. The Witt family first appear in this area of Virginia in 1745 when John Witt began purchasing land in old Albemarle County. By 1769 John and Abner Witt had begun purchasing land on the branches of Corbin and Shorts Creek in current day Nelson County. As the Witt family expanded they sold lands to each other and purchased additional property. Littleberry Witt in Aug. 1772 was a witness to a deed and David Witt purchased (??) tract of 76 acres from Abner, March 1773. Charles, Dennett, Elisha and William Witt were now in the area. By the early 1800s David Witt owned over 400 acres of land in the mountain coves around current day Adial and Gulleysville. In November and January of 1790 David Witt and R.O. Hardy purchased part of the original Col. John Chiswell land patent of 20,000 acres. These two tracts of 80 and 140 acres where listed as being on Corbins Creek joining lands of David Witt and Bridgewater. This tract is the site of the old Witt mansion house. On March 4 1803 Robert Hardy conveyed his title to David Witt. Apparently David allowed Burgess Witt to move on the tract. On March 14, 1817 David Witt and his wife Sara conveyed the tract of land to Burgess for one dollar. The deed states this is the tract of land on which Burgess resides. 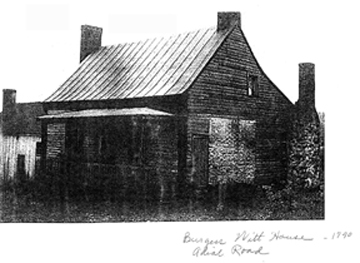 Burgess Witt's residence is marked on an 1837 road survey at the current location of the Witt house remains. Burgess lived in the house until he conveyed the tract to Dennett A. Witt as trustee Feb. 1870. The estate was transferred to Dennett A. Witt May 14, 1873, after John W. Witt's death in 1872. D.A. Witt served as sheriff of Nelson County during the Civil War. He served in 1860-63 and again in 1865. A story related by Oscar Vest, 92 years old in 1979, indicated that once the jail burned and prisoners were brought to the Witt house and confined in a small basement room about 8 x 10 feet. Some of the prisoners died and were buried just outside the family cemetery. A current cemetery map and survey lists three such stones as "prisoners." There are also four more stones inside the old fence. Dennett A. Witt is buried here and John W. Witt who Burgess passed the property to in trust. His death is listed as 1872 which explains the transfer to Dennett Witt in 1873. The property continued in Plunkett and Dickerson family ownership through the 1930s. A photograph taken in 1938 shows the house in good repair. The house was in ruins by 1970 and was reported to have been partly burned. From the remains and photographs, the house was probably built shortly after David Witt purchased the property in 1790. The deeds indicate that it was on the tract at least by 181? (last digit unreadable). The house has an unusual chimney on the north end. One half is flush with the siding and exposed while the top half is enclosed in the house and the chimney continues through the roof about 1 foot from the edge. The rafters were pinned with and held with wide (?) beams. The foundation is rock with a basement under the house exposed at the south end. The basement windows contain horizontal bars. Common in this area. Another unusual feature is the huge fireplace in the north side of the house. It is 72 inches wide and 42 inches deep. It is similar to what would be expected in an outside kitchen. A ten foot wide addition was added to the west side of the house along with a rock chimney adjacent to the brick chimney. In Jan. of 1838 a group of 12 men appointed by the court surveyed and reported on a proposed mill and dam to be built on Corbins Creek by Burgess Witt. This is interesting since a road map made in 1837 shows Burgess Witt's house and Bridgewater's mill a short distance down Corbins creek. The remains of the Bridgewater mill have been found. On March 4, 1841 David Witt requested the court to approve a location of a grist mill also on Corbins Creek. David Witt and William Roberts site was also approved. "Witt's Mill" as it was called was actually located on the Rockfish River some distance away from Corbins creek. It was destroyed by Hurricane Camille in 1969. Apparently Burgess Witt never built his mill and David moved his to the Rockfish or else there would have been three grist mills in site of each other from 1837-1841.